I’m on the hunt for a new dentist. They say 75 % of people feel some degree of dental anxiety, but not me. I got a good start with a wonderful childhood dentist. I was a patient of the senior Dr. McCorkle and then the junior, Dr. Mike. Teeth cleanings were an excuse to dig in the ‘Treasure Cove’, a little nook devoted to those curios all mothers loathed (I was a sucker for the Trolls myself). But the best part was the Treasure Cove Drawing; every month they’d pull a name out of the mini chest and the lucky winner would receive a life-sized stuffed animal. Friends, at age five and three quarters my life began. My name was drawn and I was sent home with a sheep dog that was almost as tall as me. I don’t think I stopped smiling for a solid week. And, I haven’t won anything since-HA! I’m on the hunt for a new dentist in New York and it got me to thinking about the wonderful memories I have of your office and semi-annual teeth cleanings. I remember the awesome Highlight’s Magazines in your waiting room. I loved the hidden picture puzzles and the jokes. Sometimes, I secretly hoped you guys were running late so I could keep reading. And that Treasure Cove (pure brilliance)! Winning a giant sheep dog pretty much made my year! If that wasn’t enough, there was bubblegum fluoride and a new toothbrush every visit. No matter how hard I tried, I never could find the toothbrushes with the sparkles anywhere else—and believe me, I tried. I’m proud to say I’m still taking excellent care of my teeth—never a cavity in my twenty-seven and a half years. I won’t fib and say I floss daily, but pretty close to it. That woodcut sign about loosing your teeth in Ava’s room put the fear of God in me. 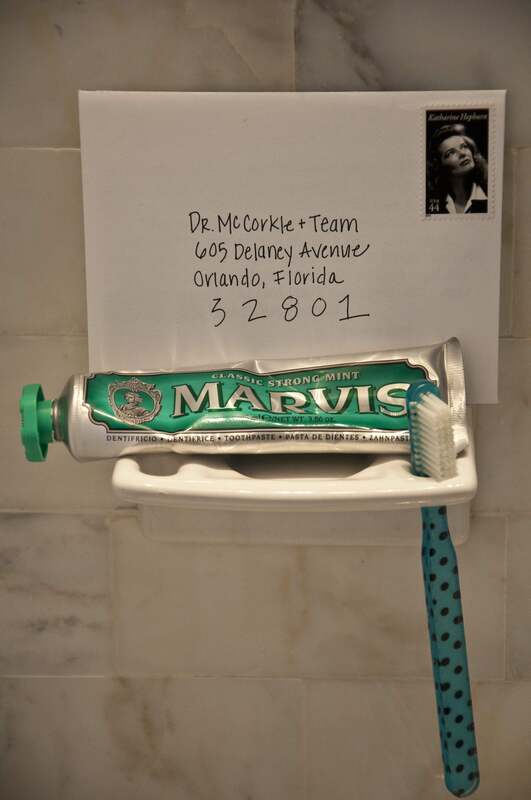 I miss your whole staff (special hello to the Gator fans in reception) and just wanted you guys to know how much I (and my gums) appreciate my good start in dental care. Hope all is well on Delaney Avenue!